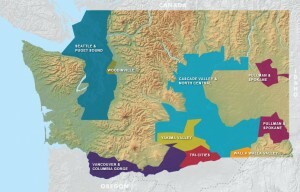 The Wine Regions of Oregon and Washington…. With it’s cooling Pacific breezes and ideal hilly and mountainous landscapes, Oregon and Washington have long been associated with outstanding wine. 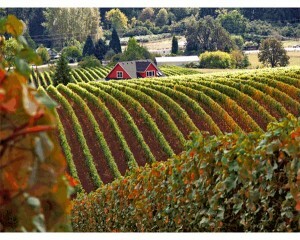 Washington State is a premium wine producing region located in the northwest corner of the United States. Although a relatively young wine industry, it is the nation’s second largest wine producer and is ranked among the world’s top wine regions. Washington wines are found nationally in all 50 states and internationally in more than 40 countries. With 43,000 acres planted, the state has ideal geography and conditions for growing premium vinifera wine grapes. Primarily grown on their own root stocks, which support healthier plants, vines produce grapes of consistent quality, resulting in strong vintages year after year. While wine grape growers in Washington focus on Riesling, Chardonnay, Cabernet Sauvignon, Merlot and Syrah, the region also produces a wide range of other spectacular white and red wines. Oregon is a world-class wine state with 15 approved winegrowing regions and more than 300 wineries producing 72 varieties. Oregon is blessed with some of the most diverse and beautiful wine-growing landscapes in the world. From the benchlands soaring above the Columbia River Gorge to the Willamette Valley’s green, rolling hills to the high mountain valleys of Southern Oregon, there are some incredible sights to behold—and some incredible wines to taste. In Oregon, winemakers are farmers, families and environmental stewards who believe in high-quality artisan wine. Most Oregon wineries are relatively small, producing on average just 5,000 cases a year.